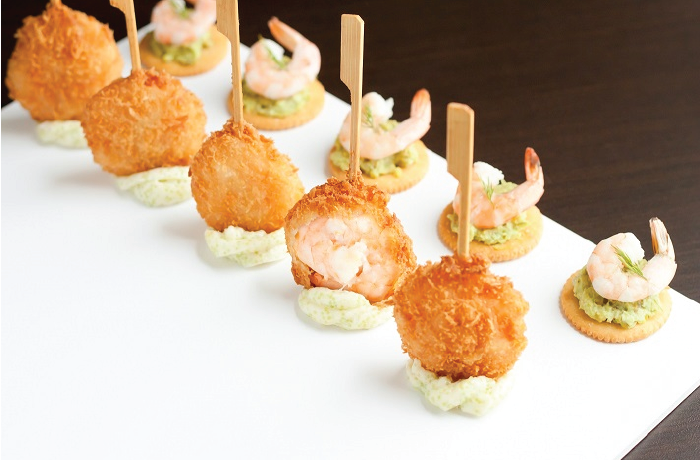 Frozen breaded shrimp skewers. Simply deep-fry and serve with a sauce for a quick appetizer. Ingredients: Shrimp, Enriched Wheat Flour, Water, Modified Corn Starch, Salt, Corn Starch, Tapioca Starch, Vegetable Shortening [ palm (non hydrogenated)], Sodium Tripolyphosphate, Sugar, White Pepper, Diacetyltartaric and Fatty Acid Esters of Glycerol, Yeast, Soy Flour, Dextrose, Ascorbic Acid, Xanthan Gum, Guar Gum.